The K-Sun PEARLabel® 360 thermal transfer label printer received a bronze award in New Equipment Digest’s King Award Packaging Equipment and Supplies Category. SOMERSET, Wis. - April 25, 2013 - PRLog -- K-Sun Corporation's new PEARLabel® 360 label printer system has received a Bronze "Industry Best" award from New Equipment Digest magazine's second annual King Awards. "We are thrilled that our PEARLabel 360 received an award this year," said Michael Kasun, president of K-Sun Corporation. "This is the second year of the competition, and our products have received recognition both years. That says volumes about our commitment to providing superior labeling solutions for industrial professionals." The K-Sun PEARLabel® 360 printer was selected among several finalists in the Packaging Equipment and Supplies category by the readers of NED, who cast 6,000 votes in 10 specific industrial categories. The PEARLabel® 360 printer was featured on www.newequipment.com and in the April 2013 print edition. With an industry-first life-time warranty, the PEARLabel 360 printer uses more than 125 different supplies, including heat shrink tube, polyester adhesive, bar code, magnetic, iron-on fabric and glow-in-the-dark tapes. It prints on 1/8" (4 mm) up to 1 ½" (36 mm) width of supplies, has 15 bar code formats including QR and data matrix, and has margins settings adjustable down to 1 mm to reduce tape waste. It also features a half-cut option for easy removal of tape liner and the exclusive PEELGUARD® corner trimmer to improve label appearance, durability and permanence. The advanced software works with both PC and Mac, and a free app for iPhone® is available from the App Store®. The King Awards competition was launched in 2012 to recognize industry's best new products and named for NED's long-time Chief Editor Robert King. In 2012, the K-Sun GREEN MACHINE®, the industry's first eco-friendly, technologically advanced label printer system, received a King Award. NED is an award-winning monthly magazine of new products for industrial and manufacturing customers published by Penton. For more than 75 years, NED has been the leading source of information for general industry and plant operations, maintenance, engineering, production, purchasing and administration. Penton's titles include Industry Week, Material Handling & Logistics, American Machinist, EHS Today and others. 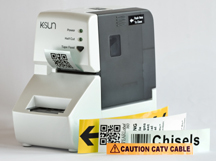 Founded in 1978, K-Sun Corp. offers a line of exclusive stand-alone and Mac/PC-compatible electronic label printers, software and supplies used in laboratory, hospital, industrial, manufacturing, research, safety, law enforcement/EMS, wire/cabling, engineering, construction, utilities, energy, transportation and other industries plus offices, warehouses and shops across the world. For more information contact K-Sun at 800.622.6312, visit www.ksun.com or email info@ksun.com.